The best way to get your boat out of shallow water is not to get into it in the first place if possible. In other words, whether you’re out on the river or in the sea, you should get a copy of the latest version of the chart of the waters you’re planning to cruise on and your boat should be equipped with a depth finder. Although most of the advice contained here is more aimed at those who boat on the sea as this is where most of the problems arise, those who cruise on rivers and canals also need to be aware of any areas of shallow water and what to do if they get into trouble. The reason you should be looking for the ‘latest version’ of the chart is that nautical areas which contain sandbanks can sometimes rise and fall according to what season it is so find out as much information about particularly shallow stretches or areas from a harbourmaster or some other suitably qualified person before setting off. Also, with a depth finder, you need to be going fairly slowly and ‘on the flat’ for it to work fairly accurately but don’t take it for granted that the readings are completely correct. Going slowly and on the flat is not a problem on a river but if you’re out on the sea and you’re breaking plane, the readings could be far from accurate. Another piece of advice if you’re out on the sea and looking to come in or head out of port is to use the buoys to help you with your navigation. So, when you’re navigating a particular channel in or out of port, remember the rule ‘red on return’. That means, when coming into port, stay to the left of the red buoys and when going out stay to the left of the green ones. Buoys are usually numbered too and the numbers decrease as you’re heading in so as they get closer to ‘number 1’ you know the depth of the water is likely to be at its most shallow (but still safe) there. If you start to hear some kind of scraping noise or you feel as though you’ve bumped into something, cut the engine immediately so you don’t ruin your propeller. You must then assess the situation. Do not try to propel yourself forward as you could then end up digging yourself in deeper. If you’re not completely stuck, the first thing you should do is to get the crew and everyone else on board to move away from the area which is perhaps stuck. You can potentially gain a couple of inches that way and on a riverboat for example, you may then be able to use the boat pole to push your way back. 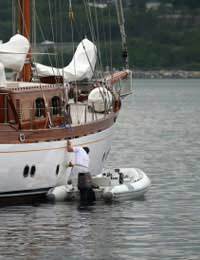 On a larger yacht, however, where the boat is too big to use a pole, lift up your propeller and try to back out. In the sea, however, only get into the water to assess its depth if the weather permits and also make sure that the boat is anchored first and that someone else is on board. If you can’t raise your propeller, you’ll then need to radio for assistance in getting a tow. If you’re on the sea, however, and you’ve hit a sandbank at low tide, you may find that once high tide arrives, you can simply push back. On a river, you’ll usually find that if you’re not grounded, simply putting the boat in reverse slowly in the direction you’ve come from will work or it might even be better to shut the engine completely and simply use the boat pole to push off and reverse into deeper water. Remember that lighter coloured water usually means that the water is shallower in that area. Even if you’ve been assured that this particular stretch is safe to pass through, manoeuvre slowly and keep an eye out for things like partially submerged logs and trees. Also, if you’re out on a river and a boat is coming towards you in a shallow channel, slow down until both boats have passed each other. That way, one boat won’t have its water ‘sucked’ away by the other which can happen if you’re manoeuvring too quickly and is one of the most common reasons why the likes of narrowboats can go aground. Also, if you have heard any scraping sounds or bumps but there are no signs onboard that it’s been damaged you should check your boat as soon as you’ve extricated yourself from the situation just to ensure that it isn’t damaged in any way. Finally, if you’re going to be living on any type of boat, you should go on some kind of navigation or skipper’s course which will be able to give you much more of an idea of how to navigate shallow water, how to keep away from it where possible and what to do if you do run aground. This will vary depending on the type of boat you have, of course, and whether you’re on a river, canal or out on the sea.